I’ve been busy on many things: my blog, my lecture notes, my assignments. 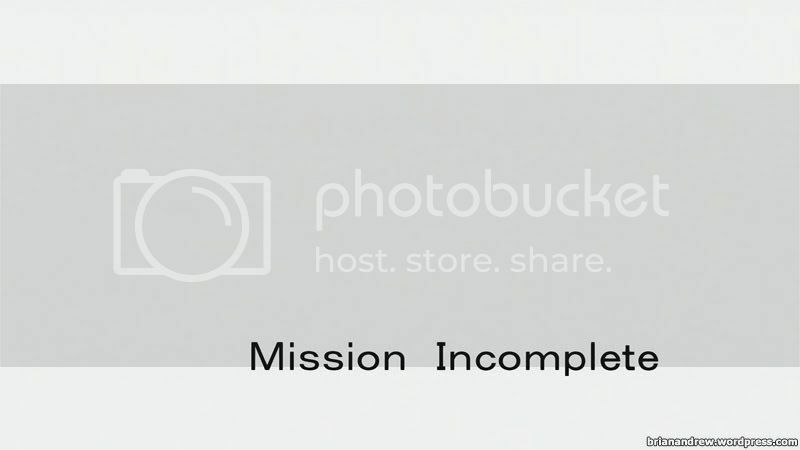 Worse still, I’ve just recently gotten episode 25 of Gundam 00. Otherwise I might get this reviewed much earlier than now. 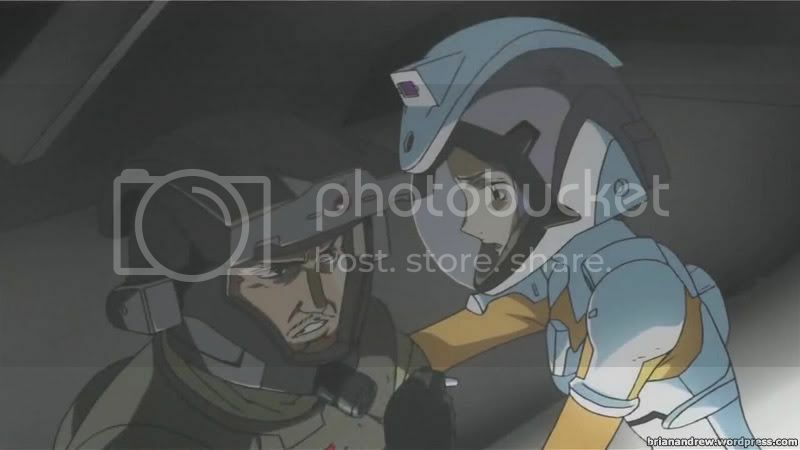 Lasse told Setsuna to blow up the container as it is no longer needed. And so he did, hoping that the explosion would do some damage to the Alvatore. But it was far from making a scratch to it. More after the jump. 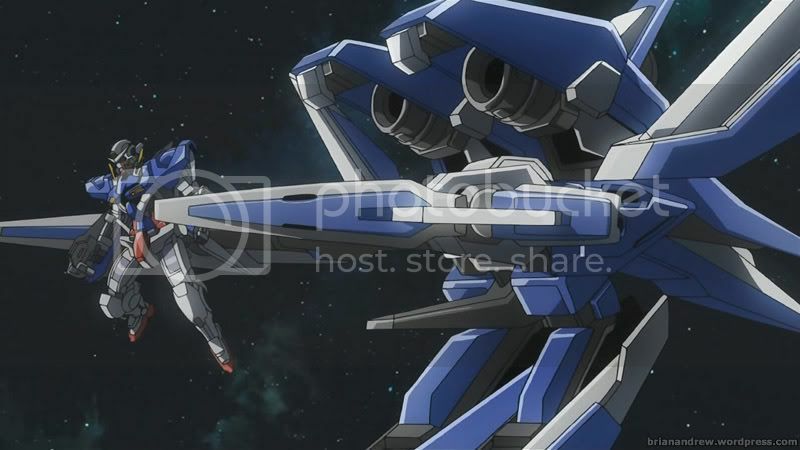 Kyrios is hiding away from the two remaining GN-X units – Sergei and Soma – when Allelujah comes up to Hallelujah. Hallelujah thinks Allelujah does not have what it takes to fight but his other half told him that they are there together. He also wanted to know the world’s answer to their battle and does not wish to die until then. So Hallelujah decided that they should team up and show them what a true Super Soldier is (New Type). 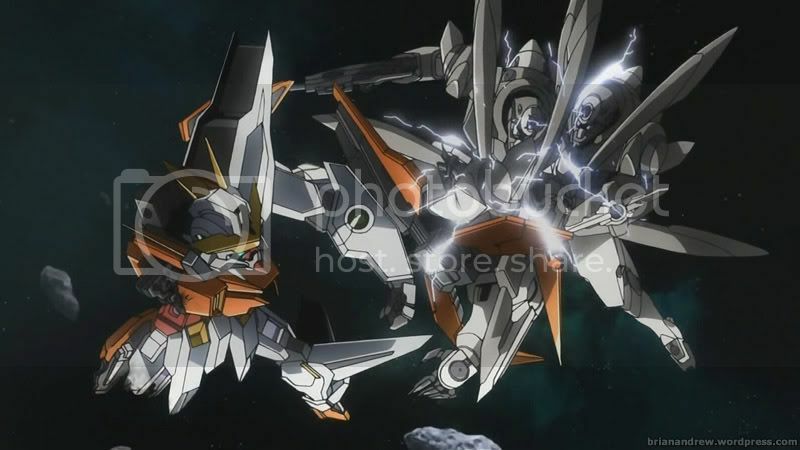 Kyrios confronts the two GN-Xs and overpowers them. 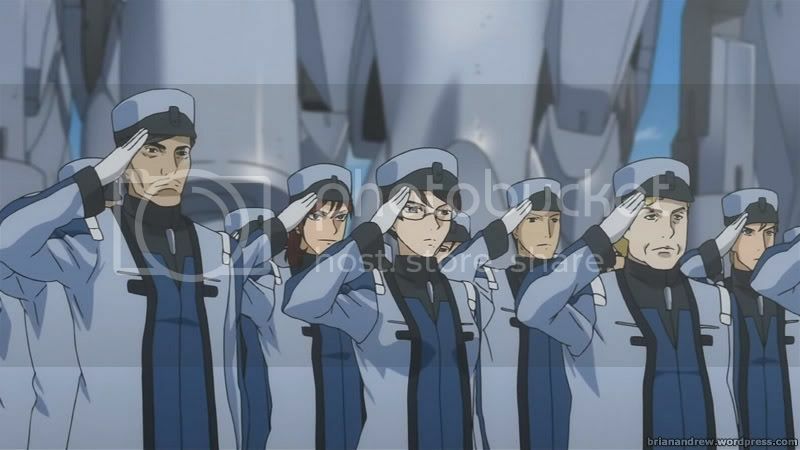 Sergei and Soma noticed that something is different with Kyrios. 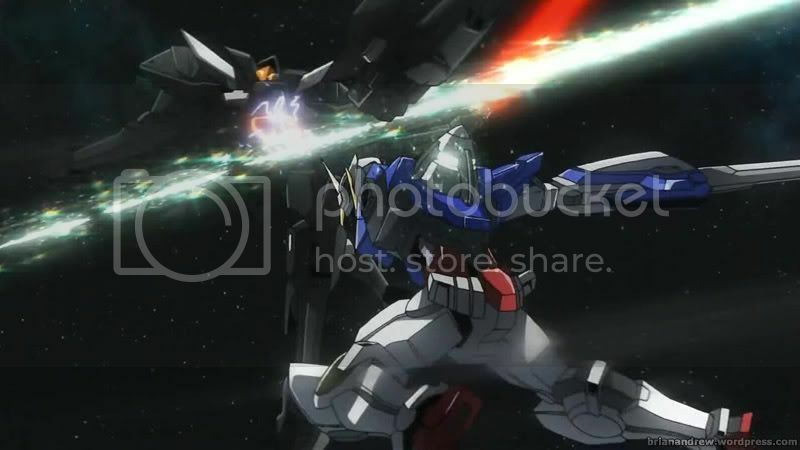 Meanwhile Exia is still confronting Alvatore when Alvatore deploys its GN Fangs. Exia then docked to the GN Armor to equal the odds. 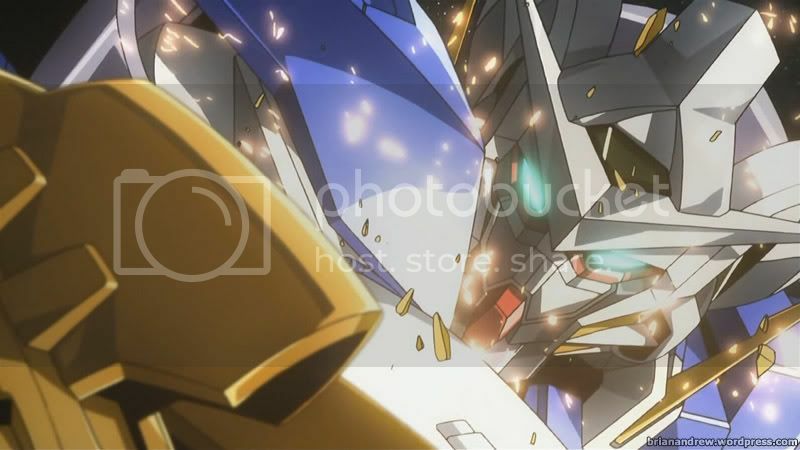 Indeed they managed to destroy one of Alvatore’s arms but yet the mobile armor was too much even for Exia in the GN Armor to handle. 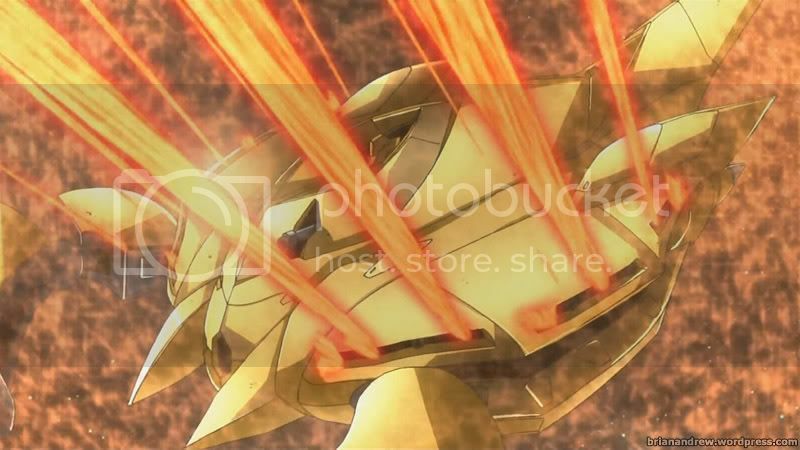 As a result, the GN Armor is heavily damaged and probably killing Lasse in the process. 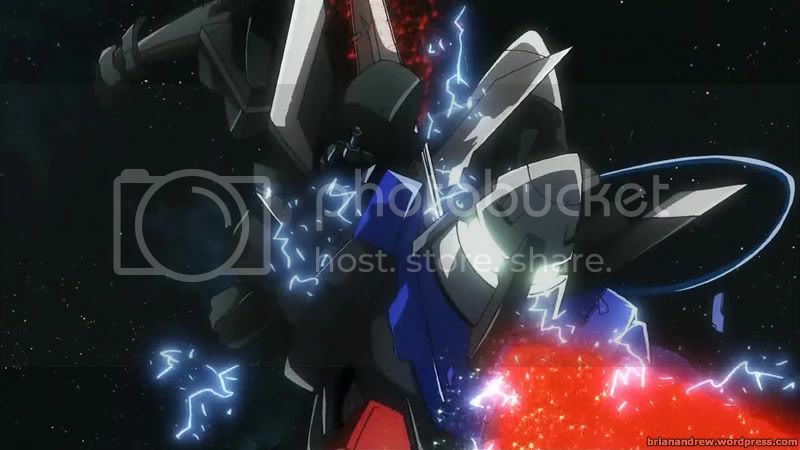 Exia managed to break through Alvatore’s GN Field and using that advantage to destroy the mobile armor. 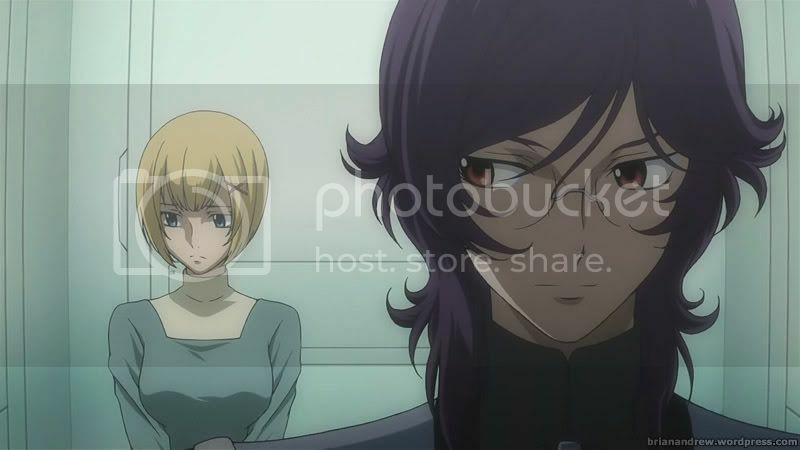 Back to Kyrios, Hallelujah confronts Soma and she told him that she is supposed to be the perfect Super Soldier. Hallelujah acknowledges Soma’s matching brainwaves and reflexes but told her that she still lags behind in terms of speed. He added that reflexes and intelligence are what makes the perfect Super Soldier. 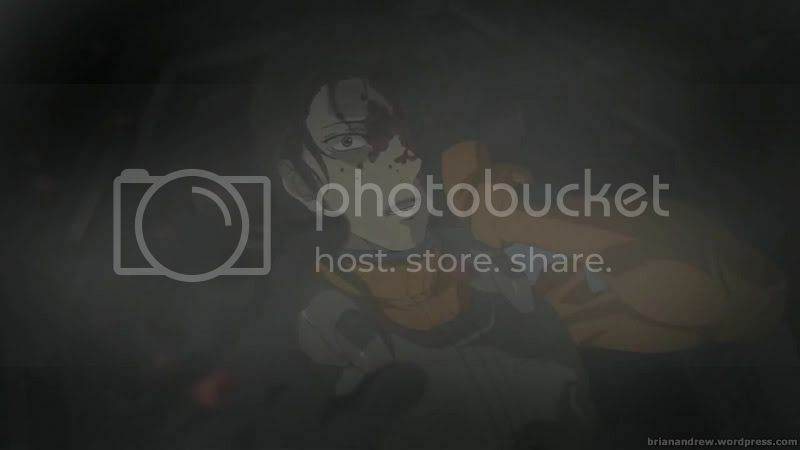 So Kyrios turns to Trans-Am and engages Soma but before Soma could take the final blow, Sergei immediately covers for her and she took that opportunity to shoot Kyrios down. 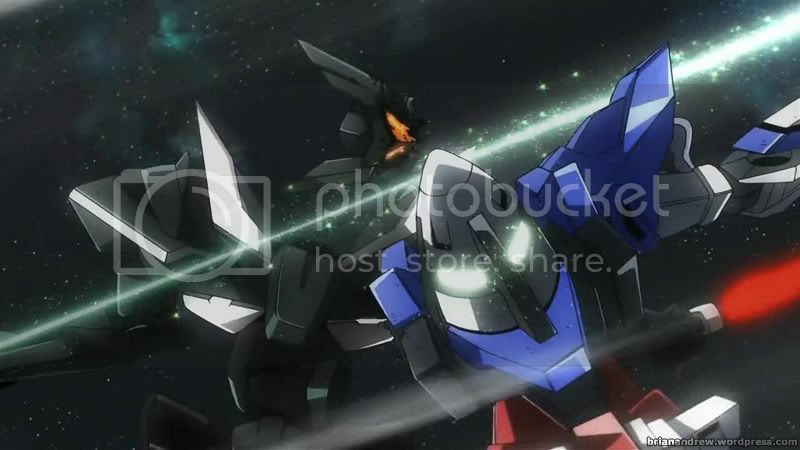 However instead of finishing off Kyrios, Soma rushed to Sergei’s side. 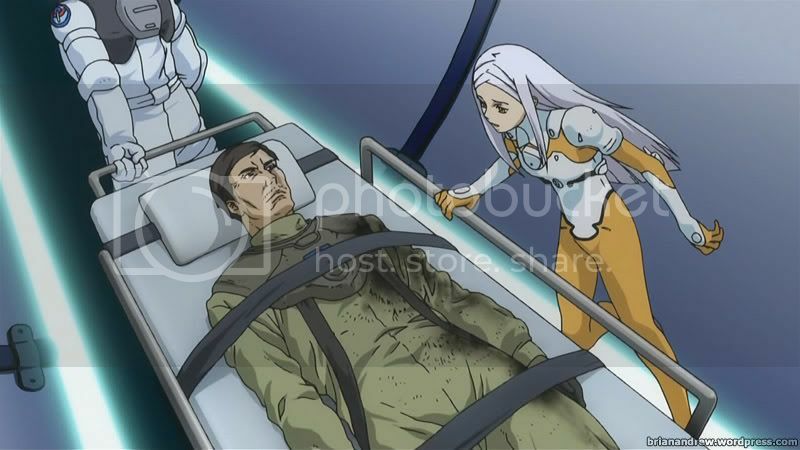 Sergei prompted Soma to chase after Kyrios but Soma feels she will be alone when he is gone. 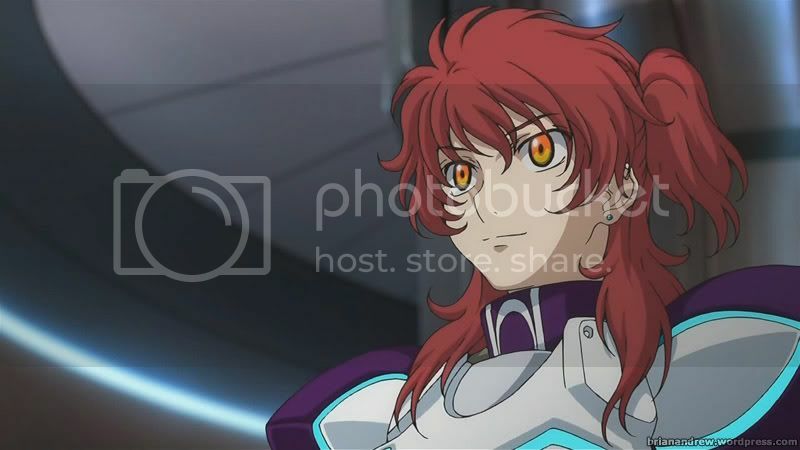 As Kyrios drifted away, Allelujah finally saw Soma’s face and realized that she is a familiar face he once knew – Mary. 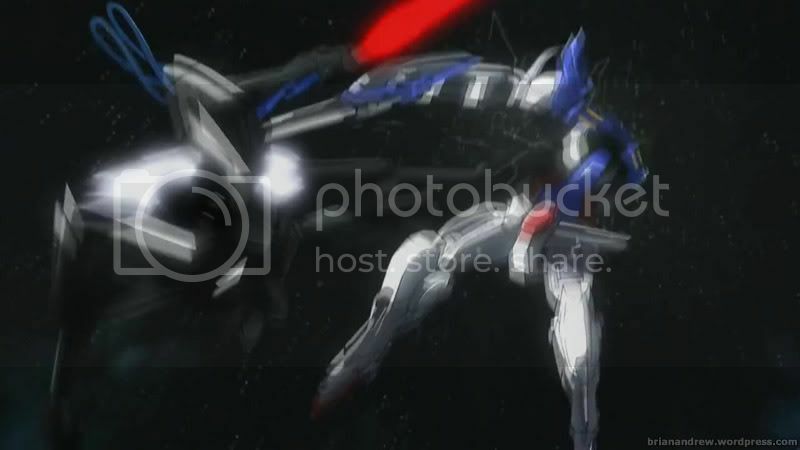 Exia’s fight is far from over when the Alvatore revealed a mobile suit coming out of the mobile armor. 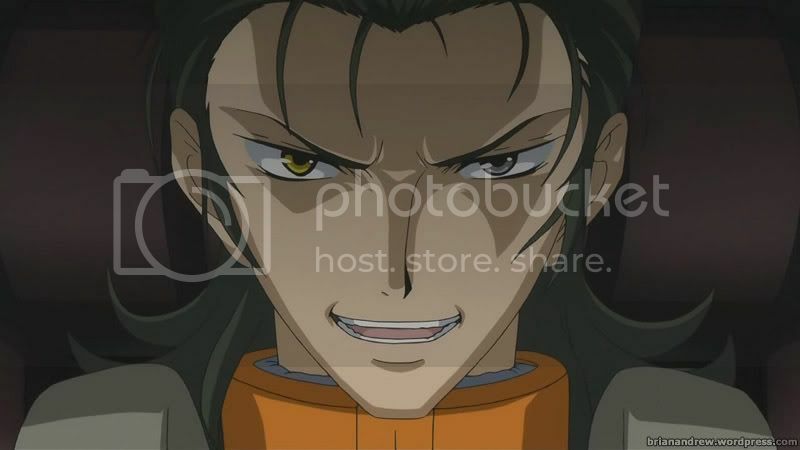 Alejandro engages Setsuna and told him his intentions – to destroy the world using the Celestial Being and reborn the world by unification against the Celestial Being. And he wishes to lead that world which he created. 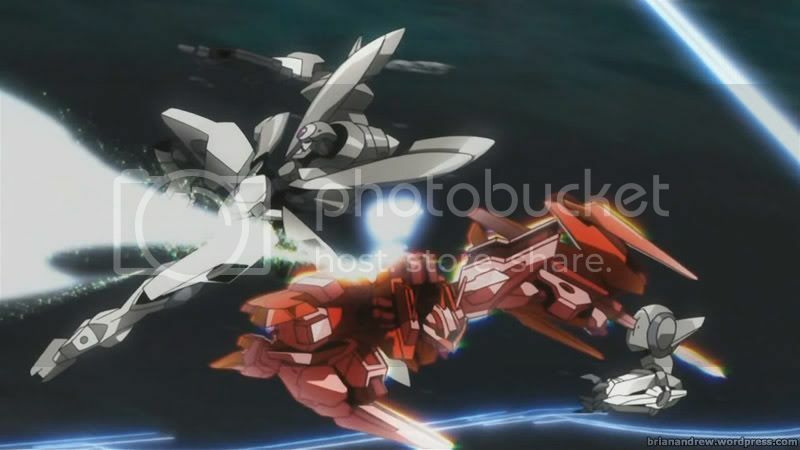 Alvatore then released a cannon beam towards Exia, thinking that he already eliminated Exia. 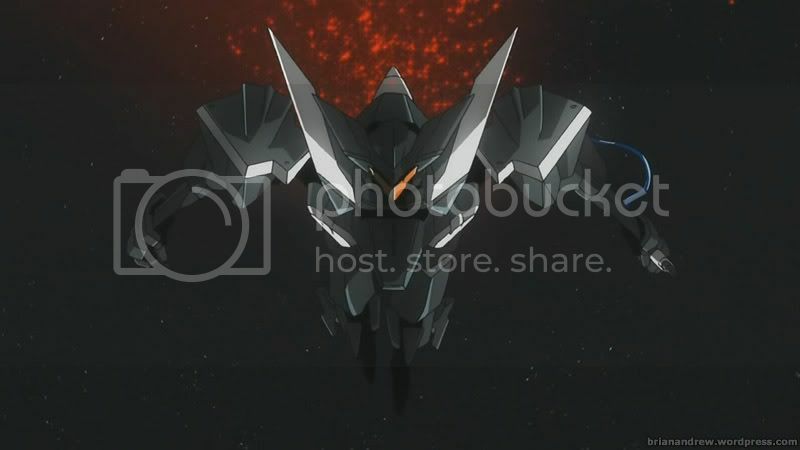 It turns out that Exia activated Trans-Am and uses this to fight against Alvatore. 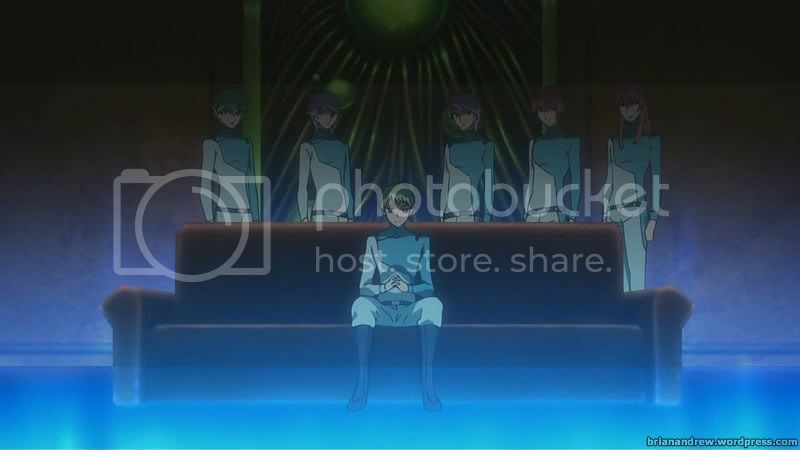 Setsuna said that he found the source of the world’s conflict and he’s referring to Alejandro. 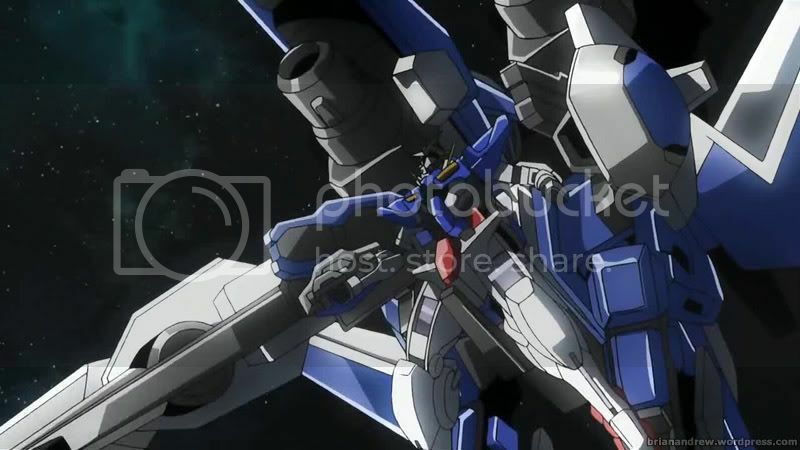 Setsuna was surprised to see that Alvatore is equipped with GN Field. 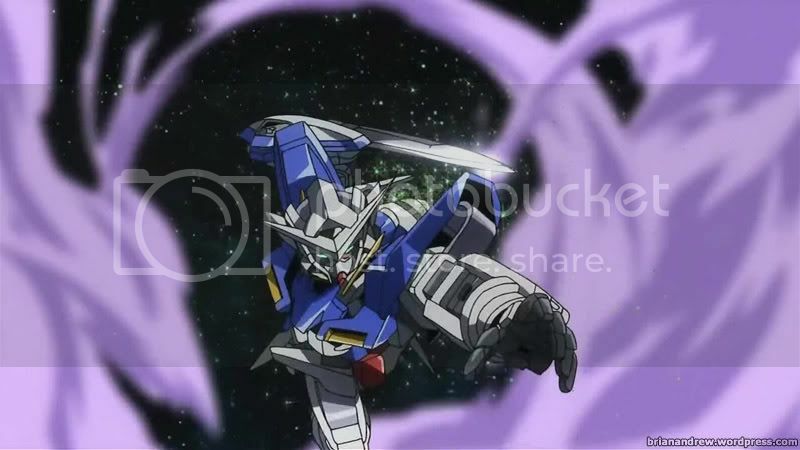 He recalls on what Lockon once told him before about the use of Exia’s GN Blade, which to destroy GN Field. Indeed the blade did its purpose to thrust through Alvatore’s GN Field and finally damaging it. Before Alvatore exploded, Livonze appeared on his screen and told Alejandro that he was useful as a tool and added that he will take charge of the world he created. Alejandro was outraged to hear this and it was all too late. Alvatore was destroyed. 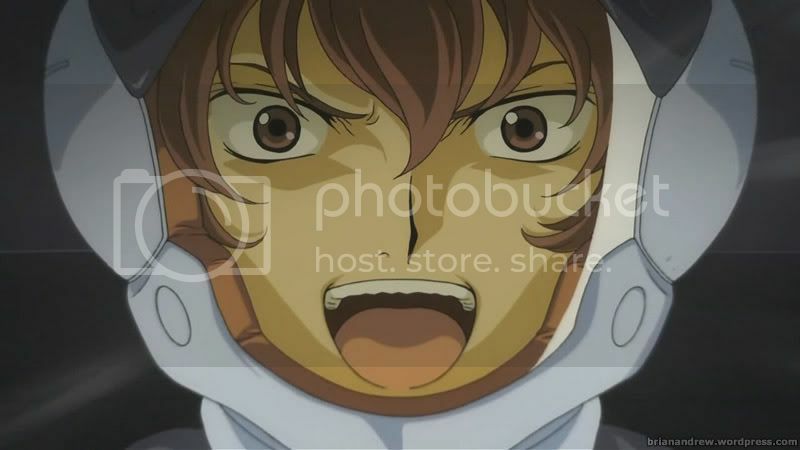 Setsuna could barely catches his breath when a Flag unit with the fake GN Drive charges fast towards him. The GN Flag is piloted by none other than Graham who is avenging for Howard and Daryl. When they identified each other using an open channel, they recognized each other. 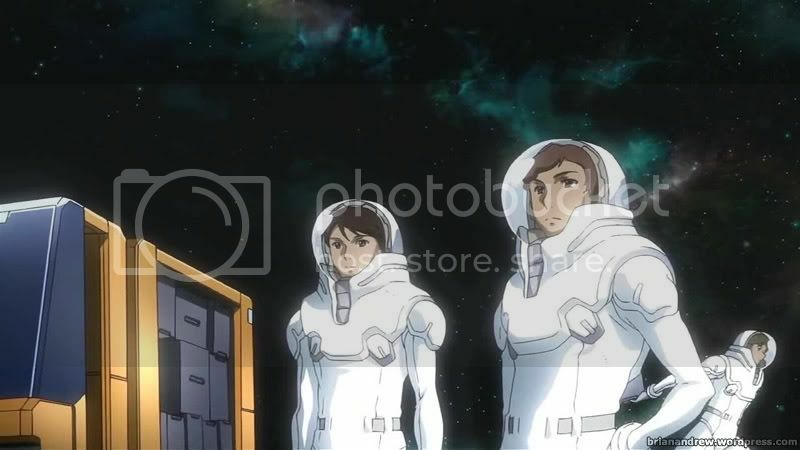 Graham believes that they are destined to fight each other and came to an understanding that the feeling he has for the Gundam is love but that feeling changed to obsession. 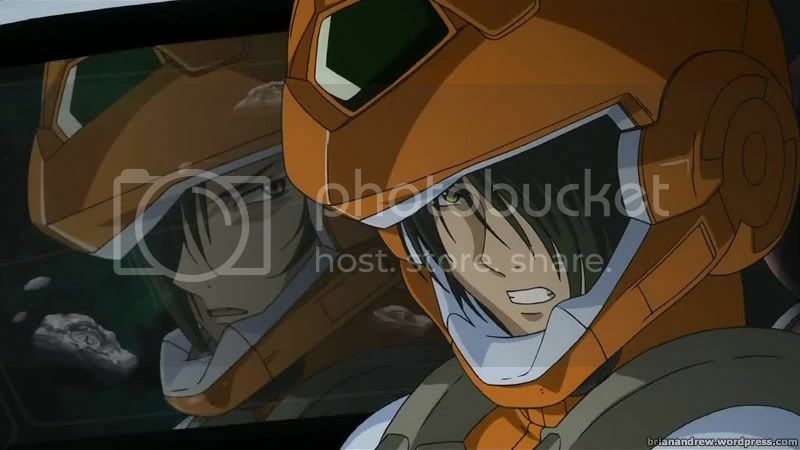 Setsuna thinks that his thinking is twisted and Graham feels the same way for the Gundams. All Graham wanted is to defeat the Gundams with his own will regardless of the consequences of the world. However Setsuna considers that Graham is egoistic and that becomes his reason to defeat him. They both charged towards each other with their saber blades, taking damages on both sides. Nadleeh floats in space and inside, Tieria thinks that the fight is not yet over. He then released Nadleeh’s GN Drive. Before he passes out, he said that he will be joining Lockon soon. Meanwhile Allelujah was still overwhelmed after knowing that Soma is Mary. Hallelujah knew about this before and believes that if Allelujah knows about it earlier, he won’t fight and this might kill him. Either way, he said that the consequences are still the same and told Allelujah that he will be leaving first. By then, Allelujah knows that his other self is dead. As Setsuna drifted on Earth’s orbit, Marina is reading Setsuna’s final message to her. It started with this: by the time you read this, I’ll already gone. 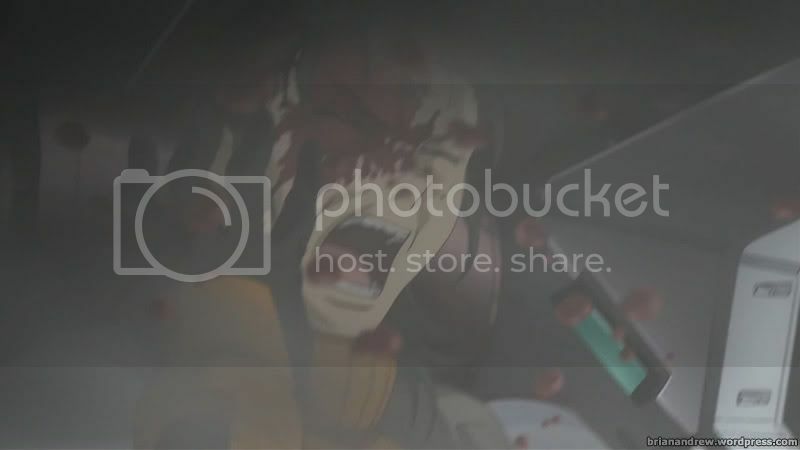 This probably suggested that Setsuna is dead. 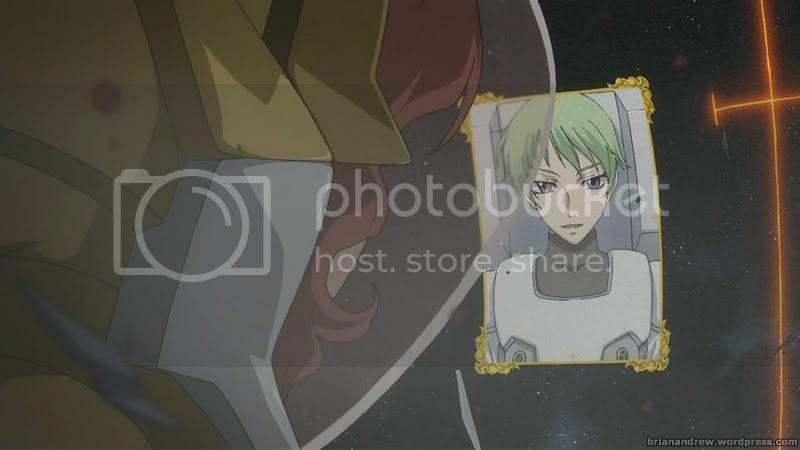 In that message, Setsuna said that he fights for the Celestial Being to end wars by armed intervention. He wanted to know why the world is so distorted, where it came from, why there are evil people, why those evil people do know that they are hurting others (the best part here is that this line was mentioned while Liu-Mei and Neena were shown in the background), why humanity exists to conflict itself, why there are people who rule and being ruled, why people hurt each other, and above all, why people keep on living this way. So he asks these questions to Marina, hoping that she could give the answers when they meet again. He will find his answer on a different path than hers with his Gundam. Four years later, Saji writes a letter to Louise. 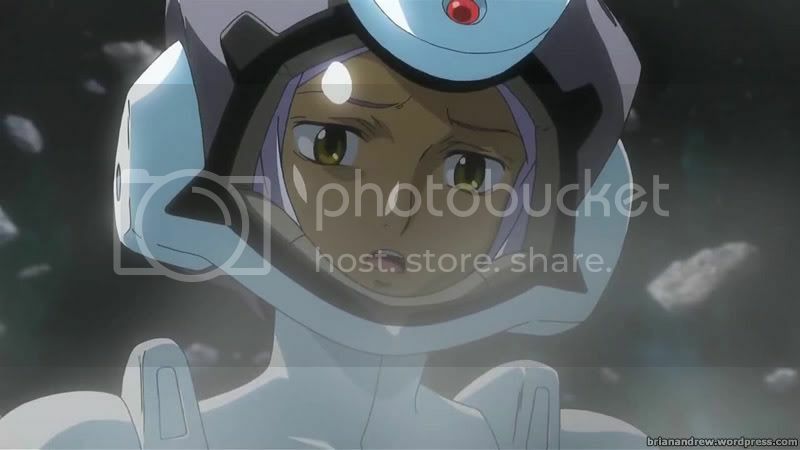 In it, Saji told her that he begins to work in space and even with many sad things going on, he said that it’s worthwhile as he could realize his dream. He also said he will be waiting for her in space. As Saji looks on to Earth, he noticed light particles moving around from Earth’s orbit. He knows that is from a GN Drive and also knows that it does not belong to the UN Army. 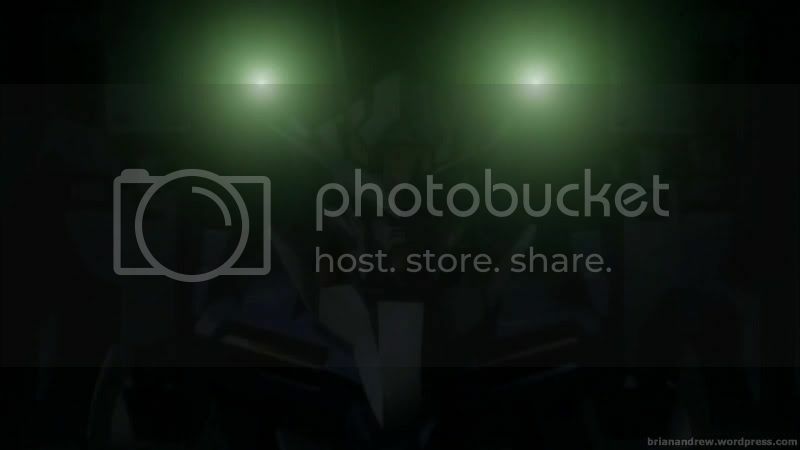 Deep inside, he knows that the light comes from a Gundam. 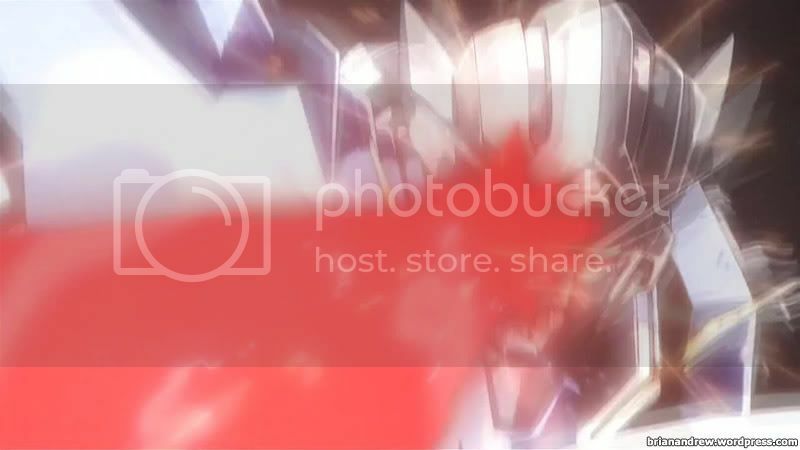 On Earth, the Earth Federation are meeting for their first year of formation and to announce the dissolution of national militaries and uses only a single UN peacekeeping army. As Marina watches this news, Shirin asking for her leave from the palace, so much to Marina’s surprise. In the background, Neena asked Liu-Mei whether the world would change instead of revolting against them once again. Of course, Liu-Mei hopes for the former. Meanwhile Livonze appeared with his group, the Innovators, which is poised to change the world. 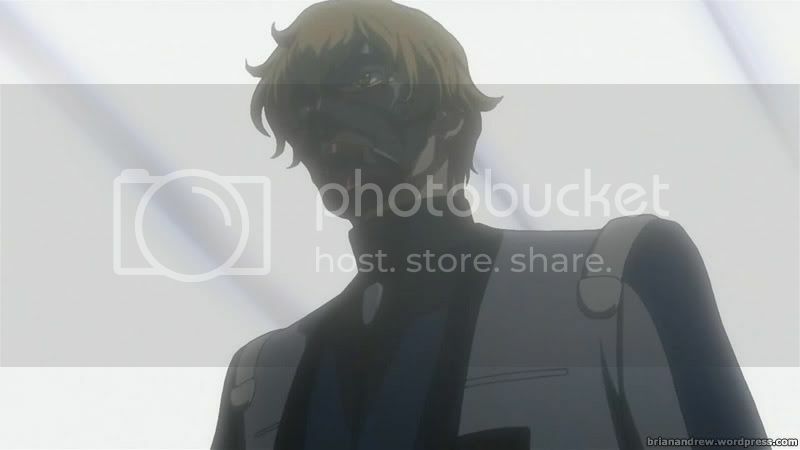 Also Graham appears with a mask, then a person presumably Al-Saachez, and Tieria (or maybe not) with his (or her) Lockon-styled hair together with Louise. Please tell me that it was unexpected. Out in space, Ian reports the progress of new Gundam development to Liu-Mei and showed her the first generation Gundam upon her request. 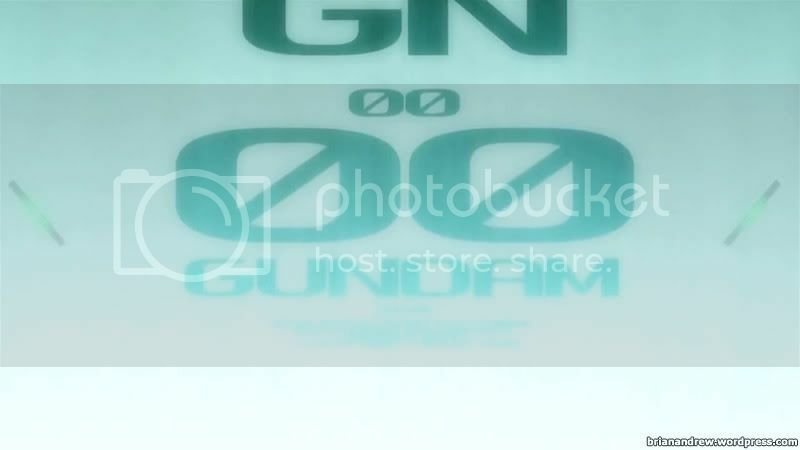 The Gundam is codenamed 0 Gundam and Ian was trying installed back its GN Drive after it was dismantled. Apparently Neena might be piloting that Gundam soon. 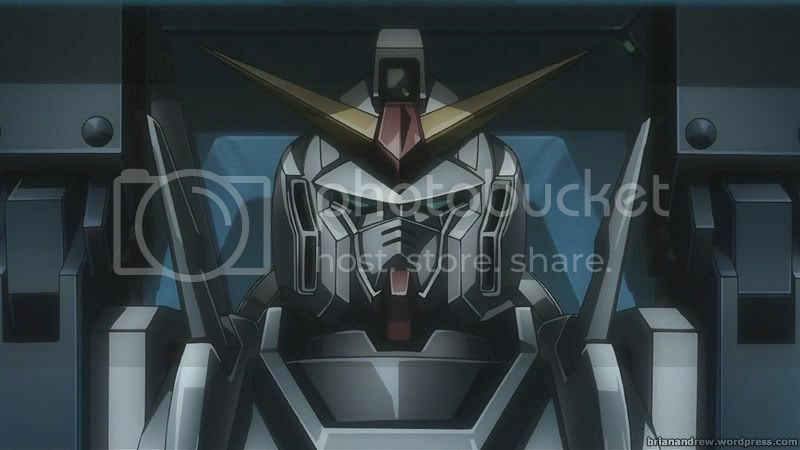 He also wonders if Exia’s GN Drive would turn out fine while looking at the hangar of another Gundam, which Liu-Mei believes to be the one that will change the world – 00 Gundam. 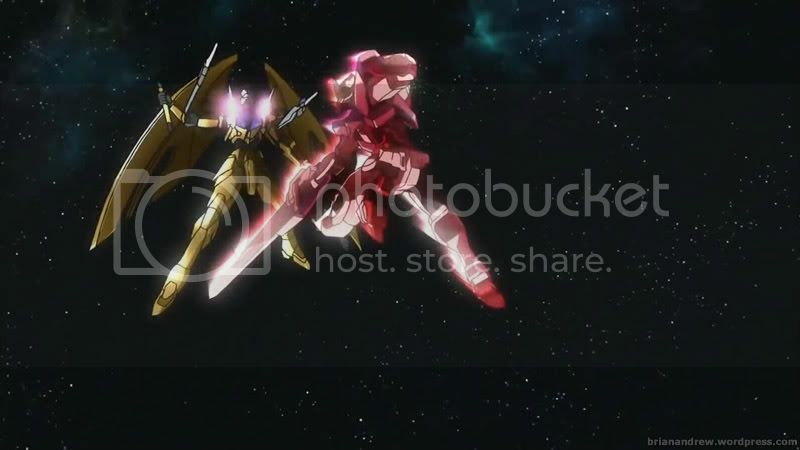 A perfect ending for a Gundam series. It was good ending. It ends with a high note. However I felt that there is something missing to the ending. Worse still, I felt that the ending was a little too rushing. Why not? Considering that Graham was forcefully reintroduced back to the story with his short-lived GN Flag. Considering that Alejandro came with his Alvatore and both short-lived in the story. Considering that Allelujah just found out that Soma is someone from his past, Mary. And that is without any further details into it. Also to consider is the four year jump. 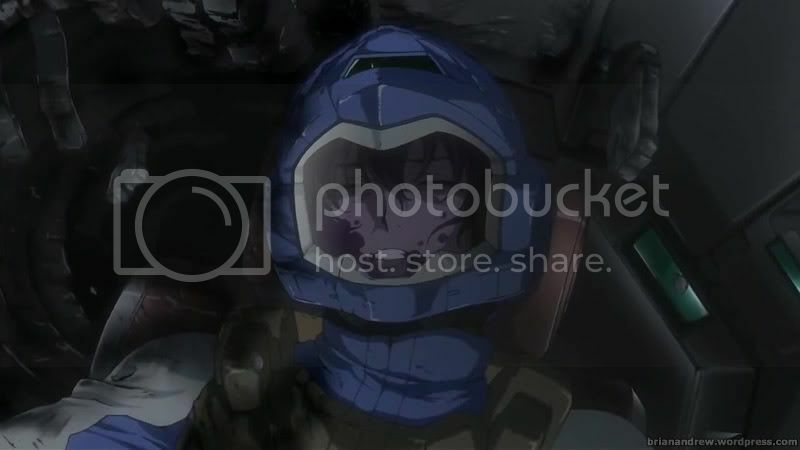 I thought the writers would just end the story up till where Setsuna exchanged hits with Graham or maybe up to where Setsuna was floating inside Exia around Earth’s orbit. Nonetheless maybe the jump was called for. Given that there are some closures are given to certain events in the story. 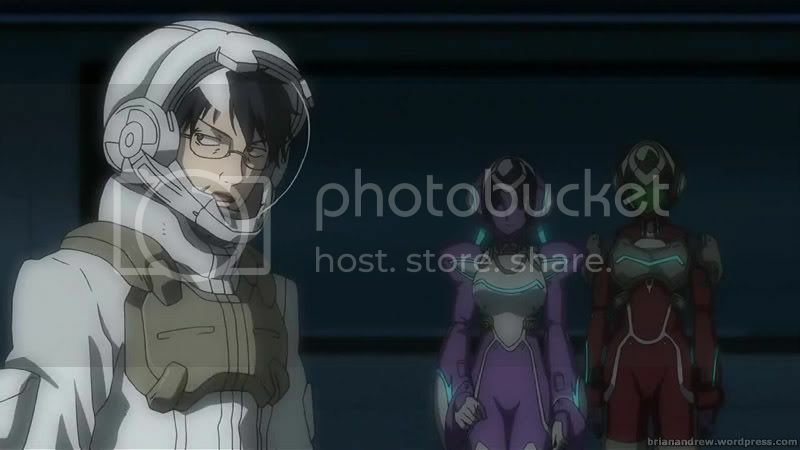 First is Saji finally realized his dream to work as an engineer in space. Second is the formation of the Earth Federation army, which comes forth the unification of the world, added with the disarmament of all the nations military powers. I guess this should serve the purpose Celestial Being was fighting for in the first place. If there is any reason Celestial Being is still continuing the fight is because Liu-Mei is the one who intends to change the world with her own will. 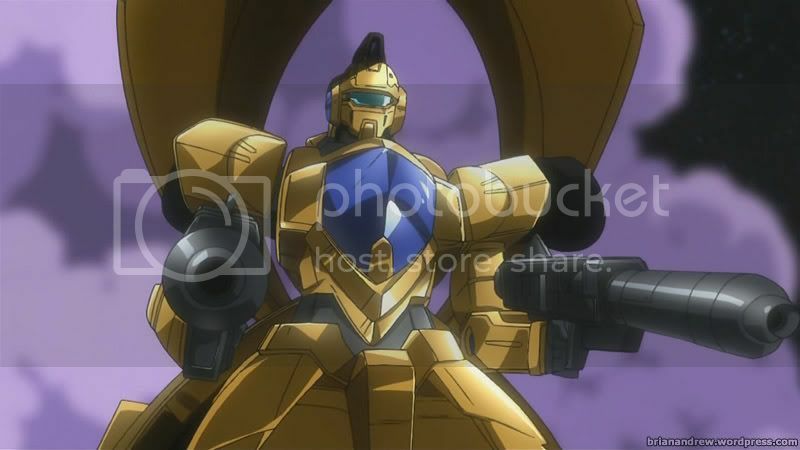 And let us not forget about Graham who comes back with a mask (and this is jut too familiar being a Gundam story, isn’t it?) and Al-Saachez who is pissed about the unified world (and I don’t know what problem he has with that…). Now looking back to the story, the plot development had always been amazing. However in the closing chapters, the story fell short to me. Nonetheless the animation is tip-top Sunrise standard. It was amazing from one episode to another. My friend suggested that the last few episodes had the best animations but I believe Sunrise maintained the excellent animation all the way. The finale was good for the season ending. In fact, it might be good as a series ending. 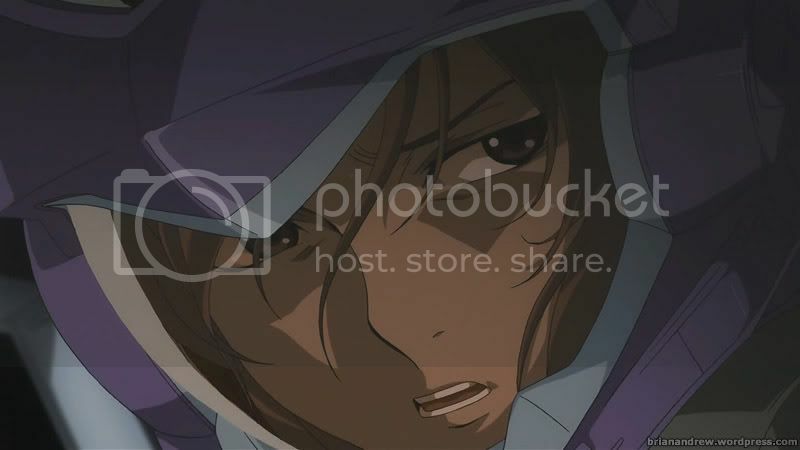 Needless to say, the first season of Gundam 00 is a blast. Hopefully the second season could be better than where the first one left off. 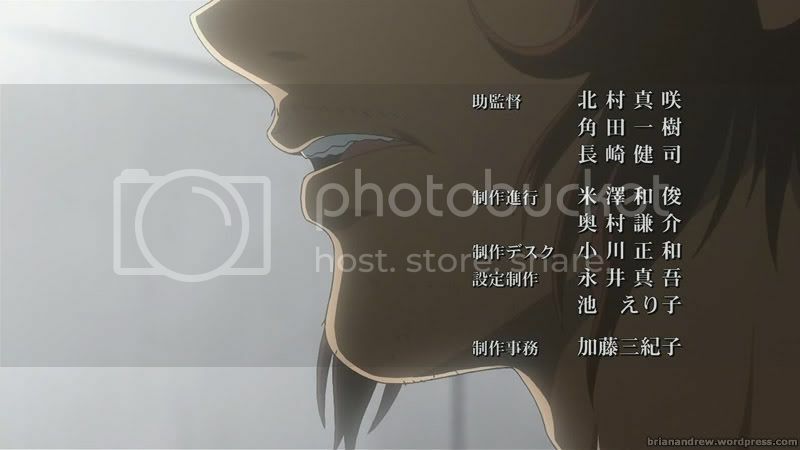 Coming next is Code Geass R2. And yes, it’s no secret – I’m a fan.